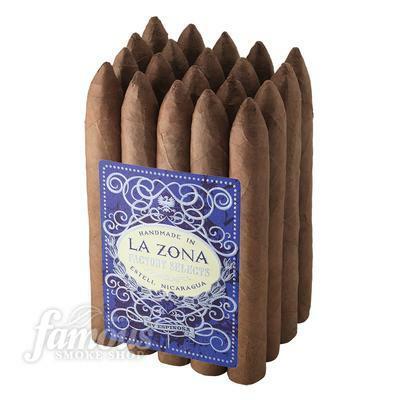 Home › CIGAR REVIEWS › La Zona Factory Selects by Espinosa | Katman Alert! La Zona Factory Selects by Espinosa | Katman Alert! He only makes them for Famous Smoke. A bundle of 20 goes for around $50 on the Famous site. I got the torpedoes (6.12 x 52 & called Bullets) for half that on cigarauctioneer.com. They had only one bundle up for sale. And no one bid against me. I’m now converted. I’ve gotten some killer deals on this Famous auction site. And no one bid against me. Anyway, I guess these sticks are seconds of the La Zona blend. I’m a big fan of Espinosa so how bad could they be? Or the better question is: How great are they? So keep an eye open, or better yet, give them your email and they will let you know when they are available. Nice tool. I just thought I would let my lovely readers know about this mysterious deal. And Wally Guse, these are medium sticks…perfect for you, my lad. I believe they come in 3 sizes. Tags: cigar reviews, cigar reviews by the katman, cigars, erik espinosa cigars, La Zona Factory Selects by Espinosa Katman Alert! I’ll check these guys out…Thanks Katman ! The man puts out good stuff. I hope he doesn’t disappoint by falling into league with the other manufacturers looking to make a fast buck by selling crap. The only problem I have with their auction site is shipping cost. $9 s/h for a five pack??? Cigarbid is about $6. I don’t understand. I’ve made three purchases over the last 6 weeks and each time, the entire shipping price was $5.99. In fact, early this month, I won $263 worth of cigars and it was only $5.99. The auctioneer site does not allow for the $5 economy ground shipping! What the $*&@! You’re in good idiocy company, pardner. I have been hitting that site hard for the last couple months. I like it when everyone else bids each other up on cigarbid. So let’s talk about this too much :).